Still great uncertainty with the upcoming weekend, as the models vary in track and timing of a coastal storm that may affect us either Friday or Saturday. It does appear that colder temperatures are on their way for Sunday. 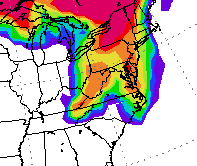 Even more interesting, the NOGAPS model has a major snowstorm for Sunday. Again, too early to tell. I'll have a better handle on it tomorrow. The latest GFS has combined with the NAM -- some rain for Tuesday. Somewhat colder, but still not wintery temperatures for the rest of the week. As has been the case this winter, the medium range period changes from day to day, with little model consistency. For the upcoming weekend- Today's GFS shows a big change from yesterday's model, with deep low pressure developing along the coastline on Saturday and rain changing to snow Saturday night. Too early to be confident about this. A cold front moves through on Friday night. The upcoming weekend looks to be mostly sunny but with fairly cold temperatures, as winter moves back in. The following week, a more typical winter pattern of very cold temperatures and possible snow at some point. Once again, the GFS has flipped away from snow for our area, Monday night into Tuesday. The latest GFS again moves the precipitation offshore. Last night's GFS still has about 0.13 inches water falling this afternoon as rain showers, starting before 1 PM. The same GFS model has very light wet snow showers before daybreak on Tuesday. Currently, it's expected that temperatures will be too warm for accumulation. Sun 1/22: Cloudy with showers, after 1 PM. Mild. Temps in the 50s. Some cloudiness is moving in today, with the warm air. For Sunday, the models are consistent with clouds in the afternoon with showers. QPF values for Sundays showers are about 0.10 inches water. Once again, the GFS has flipped back with a coastal storm, close enough late Monday night to give us some snow, especially in NJ. Precipitation amounts look light in the Philadelphia area and even less to our north and west. The path of this storm has changed from each model run, so confidence is still not too high. Sat 1/28: Partly sunny and mild. High 57. Sun 1/29: Some sun very early, then becoming cloudy. Showers by early afternoon. High near 54. 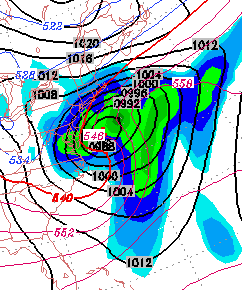 The inconsistency of the medium range models this winter again shows itself-- the storm previoulsy predicted for Tuesday is now too far off the coast to affect us. Sun 1/29: Some sun very early, then becoming cloudy. Showers in the afternoon. High near 54. The models continue to flip around and provide uncertainy beyond 2-3 days. For the coming weekend, high pressure should bring mild temps and beautiful skies on Saturday. Low pressure approaching on Sunday will bring increasing clouds and showers in the afternoon (QPF=0.15 water) This low pressure is expected to shear off to our north. 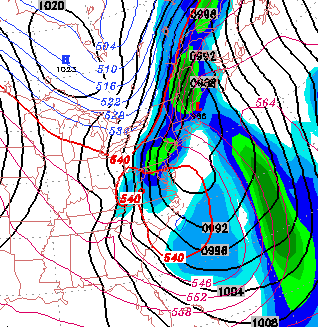 The latest GFS run has a possible snow storm for Tuesday. Since there has been so much run to run inconsistency in the medium range time frame, I wouldn't dust off the snow shovels yet. Sat 1/28: Sunny and mild. High 53. Sun 1/29: Sunny very early, becoming cloudy. Showers in the afternoon. High near 52. For the coming weekend, high pressure should bring mild temps and beautiful skies on Saturday. Low pressure approaching on Sunday will bring increasing clouds and a chance of a light shower. This low pressure is expected to shear off to our north. Sat 1/28: Sunny and mild. Temps in the upper 50s. Sun 1/29: Sunny early, increasing clouds in the afternoon. Chance of a shower late in the afternoon. High near 50. The models continue to flip around and provide uncertainty in the medium ranger period. At times, it looks like winter will return; subsequent model runs have those trends fading, only to return again. That said, the first full week of February looks like it will be cold and stormy. 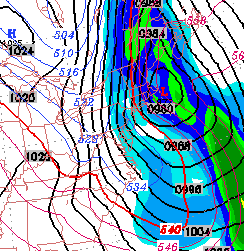 A possible snow storm around February 7th, instead of the 4th, is now shown in the models. Again, this winter has been exceedlingly hard to predict in the medium and long range, so I wouldn't dust off the snow shovels just yet. For the coming weekend, high pressure should bring mild temps and beautiful skies on Saturday. Low pressure approaching on Sunday will bring increasing clouds and a chance of a light shower. A significant rain storm for Monday evening, may change over to snow before daybreak on Tuesday. The storm for the Sunday-Monday period continues to shift in timing and position; latest GFS delays it again until Monday, with temps too warm for snow. Cold weather will move in on Wednesday. High pressure and an upper ridge will bring very nice weather for Saturday into Sunday. Low pressure approaching from the southwest will bring rain on Monday. This weekend may be the last one that's very warm for next several weeks. Sun 1/29: Sunny in the morning, increasing clouds in the afternoon. High near 60. For the final week in January, things chill down quite a bit Wed through Friday, then a warm-up and beautiful weather for Saturday. Sunday looks interesting- a cold front comes through and a low develops along the coastline, possibly giving us snow Sunday afternoon. This storm, in the Sun-Monday time frame, has been hinted at for weeks. The beginning of February does seem to suggest a big change in the weather pattern with temperatures getting colder and greater chances of snow, especially into the first full week. For the past several weeks, the GFS has been predicting a change in the pattern beginning durin the time frame 2/1 through 2/3 The most recent models have backed away from this a bit, moving the pattern change to about 2/5. Until then, the coming week looks cold (much colder than previously expected), but the latest GFS suggests warm conditions for next weekend. Continued chance for the first few days in February, but cold weather and snow returns for the first complete week in February. That said, today's weather is much colder than previously expected, which suggests not the highest of confidence in the long term outlook. A low pressure system approaching rapidly from the southwest; clouds will be on the increase after 1 PM. A period of cold weather will return this week, but the coming weekend is looking very mild. Sun 1/22: Sunny in the morning. Then increasing cloudiness after 1 PM. The latest models downplay the showers and even the clouds for Saturday. Sat 1/21: Partly to mostly cloudy. While there's a very slight chance of a brief shower mid day, most of the day will be dry. WINDY. High 57-61. Sun 1/22: Sunny. High near 50. The models continue to have mild conditions for the balance of the week. Low pressure, originally expected to give us rain on Saturday may shear off to our north and west, giving us just a chance of a light shower in the afternoon. Sat 1/21: Mostly cloudy. A slight chance of a shower in the afternoon, but most of the day will be dry. WINDY. High 57-61. Sun 1/22: Sunny. High near 49. The extended range GFS model has been consistently predicting a major weather change for the first week in February. Current rough details: rain changing to snow on Monday, 1/30 and a possible significant snowstorm on Wednesday into Thursday 2/3. Bitter cold temps to follow. It's aways off, but winter is coming back. I'll keep an eye on this. Sat 1/21: Mostly cloudy. A slight chance of a shower in the afternoon, but most of the day will be dry. High 55. Sat 1/21: Mostly cloudy. A chance of a shower in the afternoon. High 55. Colder (but not cold) air will filter in today behind the front that moved through mid-day. Things are quiet through Friday. Saturday, a low pressure system approaches bring rain showers during the day. Things clear out for Sunday. Temps remain above normal for now. Sat 1/21: Cloudy with rain showers, especially in the afternoon. High near 50. Sun 1/22: Mosty sunny and seasonably cold. High low to mid 40s. The models continue to have mild conditions for the balance of the week. A heavy rain storm will affect us later this afternoon through mid day Wednesday. Temperatures move into the 40s and remain in the 40s and 50s as high temps for the balance of the week and weekend. Sat 1/21: Becoming mostly cloudy by afternoon. Chance of showers late. High 49. Sun 1/22: Partly sunny. High 48. The models continue to have mild conditions for the balance of the week. A heavy rain storm will affect us Tuesday night through Wednesday. Temperatures move into the 40s and remain in the 40s and 50s as high temps for the balance of the week and weekend. The weekend outlook: mild with rain likely on Saturday. I'll update as the weekend approaches. The Ensemble forecast suggests a near 100% chance of snow, and the QPF values suggest that the operational GFS is possibly understating the amount of precipitation tonight as snow. Last night's GFS (1 AM run of the model) still has snow, starting about 9PM and ending before daybreak Sunday. QPF values have been reduced to about 0.14 inches water. Considering ground temperatures, probably a coating up to 1.5 inches will accumulate over night. Tonight's GFS model continues to show wrap around moisture and cold air Saturday night- snow starting about 10PM. A total of 0.24 inches water (QPF) translates into 2-3 inches of snow by daybreak Sunday. Information about the models can be found at here. As usual, the NAM model shows nothing happening Saturday evening. I'm ignoring the NAM model. The latest GFS model has precipitation continuing into much of Saturday night. Temperatures at the surface and at critical levels of the atmosphere drop below freezing about 10PM Saturday night. 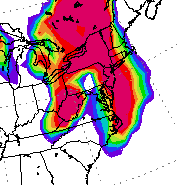 Several inches of snow is possible by daybreak Sunday, according to the latest GFS model. The models have been inconsistent with this scenario. Confidence is not as high as usual. b>Sat 1/14: Rain througout the day, continuing into the evening. Becoming WINDY. The latest GFS has rain changing to snow about 10 PM Saturday night. Several inches are possible by Sunday morning. High in the upper 40s, falling in the late afternoon into the 30s by evening. Sun 1/15: A mix of sun and clouds windy and colder. High near 40. I'll update this evening and tomorrow morning. Statistical breakdown for snow Saturday night. Orange is 70%. Low pressure off the coast Friday and Saturday will bring heavy rain Friday night and wrap around rain and showers through Saturday. Winds pick up late in the day on Saturday and temperatures will fall. It appears that some wrap around moisture and cold air aloft may result in a coating of snow before daybreak on Sunday. Sat 1/14: Rain before daybreak will taper off to showers during the day. Mild temps initially, but will fall in the late afternoon as winds pick up. There's a chance of snow showers late at night, perhaps giving a coating of snow by Sunday morning.. High in the upper 40s, falling in the late afternoon. It's just going to be too warm for snow. Cold air doesn't come in until well after the storm departs. This has not been the usual winter and the model consistency this week has been anything but impressive. Sat 1/14: Rain before daybreak will taper off during the morning. VERY WINDY. High temperature ealy in the day, but temps falling in the afternoon. There's a chance of snow flurries at night, perhaps giving a coating. High in the upper 40s, falling during the day. Sun 1/15: A mix of sun and clouds still windy and seasonably cold. High near 39. The most recent GFS still advertising a 'negatively tilted' low pressure system to develop on the coast and move slowly from Friday night through Saturday night. Rain Friday night will reduce to light showers on Saturday, but wrap around moisture and negative tilt aloft will bring in cold air, causing a change to snow late Saturday into Saturday night. Some small accumulation is possible, but too early to call. Sat 1/14:Rain early will turn to showers and then snow showers during the day on Saturday into Saturday evening. Possible small accumulation. VERY WINDY. High in the low 40s, falling to the 30s in the afternoon. A change in the forecast: The latest GFS has deep low pressure developing off the coast Friday night, with heavy rain into Saturday morning. Cold air filters in aloft on Saturday and wrap around moisture may fall as a period of snow on Saturday afternoon. Temps will be falling and surface temperatures will be warm, so it's difficult to judge about accumulation, if any. Cold air and windy conditions persist into Sunday. Sat 1/14:Rain early will turn to showers and then snow showers during the day on Saturday. Possible small accumulation. VERY WINDY. High in the low 40s, falling to the 30s in the afternoon.